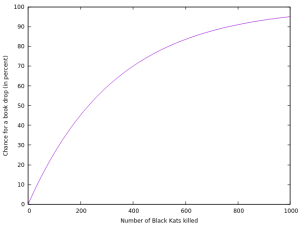 Clockwork Traveller » How many Kats do you have to kill for one book? How many Kats do you have to kill for one book? Ok, I already gave the percentage of book drops to be less than half a percent in the hunting FAQ. 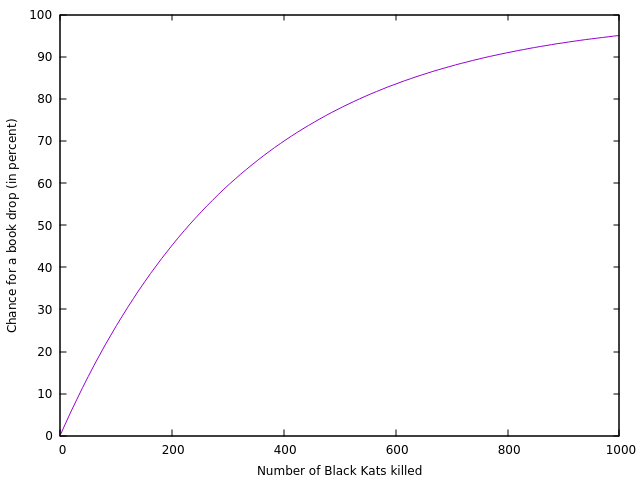 But that’s not a very handy number as it only tells you that statistically there is one book per 200 Kats if you kill significantly more than that (we are talking several magnitudes here). As you can see, it takes some 800 encounters till you can be reasonably sure that you will end up with book of dark rituals. Assuming an average of 20 Kats per Candlestick Keep, that comes down to farming something like 4k levels. Happy hunting!